One of the most common — and highly recommended! — rituals to remind teams of these principles is the retrospective, “an opportunity for the Scrum Team to inspect itself and create a plan for improvements to be enacted during the next Sprint.” Oftentimes the centerpiece of these retros is an exercise called the agile starfish. Its creator, Pat Kua, says, “This particular retrospective technique helps people by getting them to reflect on varying degrees of things that they want to bring up, without having it fit into the black or white category of ‘What Went Well’ or ‘Not So Well’.” I love how the nuances actually encourage discussion: oftentimes, team members will put the same topic in different categories. “I thought we were doing that,” or, “There was way too much of this…why do we need more?” and so on. So much of our time & attention is paid to the actual work we’re charged with that this is a great way to bring attention to our meta-work — the things that we do to do our work. While there’s room for nuance in this framework, a source of friction that I’ve often come across is that [something] happened, but we’re not sure what to do about it. The More/Less/Start/Stop/Keep framework implies that we have solutions, or at least observations, in mind. How do we best capture and make the most of our experiences? How might we ensure that we’re not just changing the way we work, but doing so in a way that compounds the value of our shared & individual experiences? How do we handle time/attention investments that didn’t fit neatly into the stories assigned? Furthermore, how do we reinforce that growth is really good for the team and product? 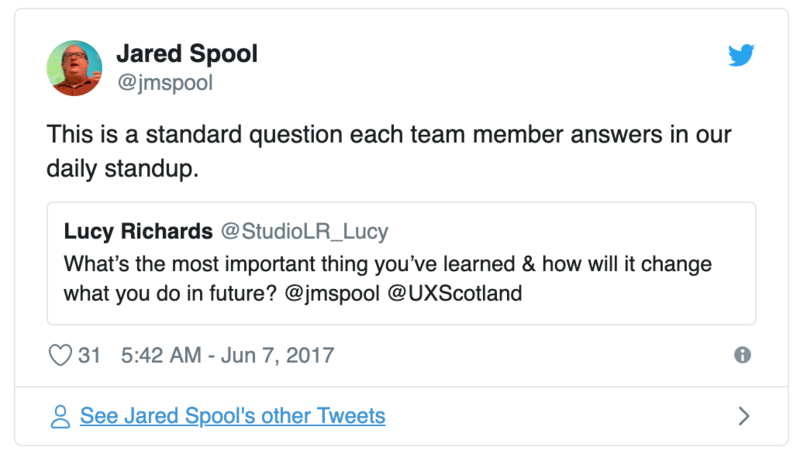 How Might We capture specific things we learned in the past sprint? So it’s in that spirit that we recently added an attribute to this classic model: a learning center. Growfish: An agile starfish with a growth mindset. I won’t spend a ton of time trying to convince you of the value of a learning mindset. But I will spend some time. “What are you learning right now?” is a fundamental question to anyone who’s trying to get better, be better, and/or do more. The speed of life and business and change is only accelerating, and one of the most effective ways to keep up is to team up with those around you. Yikes. That’s some Capitalism Noir material right there. Or is it? Think of it not so much as remaining employable, but growing into who we’re supposed to be. Humans thrive when we’re wrapped into an accessible challenge in service of something larger than ourselves. Living into that can be exhilarating. And it’s true for organizations, as well. In order to win, your learning must—at least —keep up with the pace of change around you. Get yourself some high-quality thinking, friends! In summary, learning is important. Critical. What if we saw this as part of our collective responsibility, that we actively help each other learn, compounding the impact of our experiences & knowledge? As we go about our days & different work, we discover new information & relationships. It’s a massive loss to everyone involved when these discoveries don’t make it to the broader team and they have to go through the process — and waste!—of learning the same things. Learning isn’t just additive for personal, revenue, & operational, reasons; it’s a savings mechanism widely & somewhat organically distributed. This learning center helps the team out of a performance mindset that can emphasize changing the way we do things, but not why. It’s akin to the difference between Activity and Productivity, or Efficiency and Effectiveness. Within this Growfish framework, we’re identifying what we’ve learned, discussing its implications, and how to apply it. Frequently bringing learning & growth into our meta-work conversations can help us see the forest for the trees and bring us out of the episodic incrementalism of optimizing for what we do in the near term (at the expense of the long-term). Let’s say you’re in a retro using this learning center. There are a handful of great notes in the learning section, but one stuck out. As you can see in this fictional-but-based-on-real-life-events example, a central learning can help draw out more information from the group and improve the way they work on a different level. Each of these learnings had outcomes that belonged in a couple other sections. It’s possible that we wouldn’t have discovered these outcomes had we not discussed what we had learned. 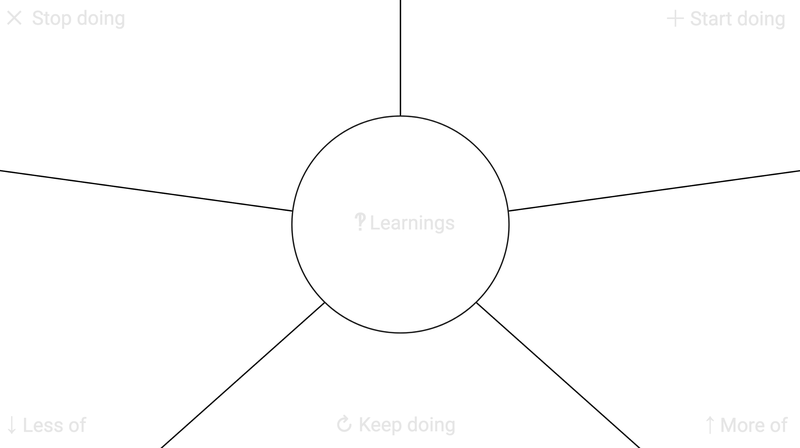 Coming at our experiences from a learning angle, and talking them through, helped the whole team get clarity, improve alignment, and learn our way further towards success. PS: This is a new tool/concept, so we would love your assistance in trying this out and reporting back in the comments. I’ve made this a public Miro* template, for easy testing. Thank you! *If you’re not using Miro, you should be!